TV-WM-TygerClaw-LCD6407BLK for 10inch - 23inchTV/Tilt -30˚ to +30˚/Swivel up to 180˚/Max 33lbs/15kgs. | Québec Systèmes Inc.
TV-WM-TygerClaw-LCD6407BLK for 10inch – 23inchTV/Tilt -30˚ to +30˚/Swivel up to 180˚/Max 33lbs/15kgs. 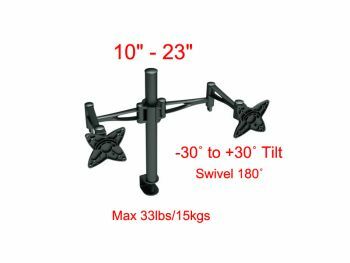 TV-WM-TygerClaw-LCD6407BLK for 10inch - 23inchTV/Tilt -30˚ to +30˚/Swivel up to 180˚/Max 33lbs/15kgs.